At their annual animal shelter conference, I sat listening to the welcome address by the President of the nation’s largest humane organization. He said that ending the killing of savable animals was within reach across the country, called upon all shelters to commit themselves to doing so, and he gave them the prescription to do it: the programs and services of the No Kill Equation. He then presented different shelter managers who had embraced this effort so that they could speak about their experiences: Like the one who came into an open admission facility with a 65% rate of killing and reduced it to under 4% in one year. And another who took over a shelter once described as “hopelessly overcrowded” but now has a 97% save rate. And still another that has seen enforcement decline 70% after going from a punitive philosophy to one that makes it easy for people to do the right thing, through a series of community based incentives such as free and low-cost spay/neuter. It was like a dream. 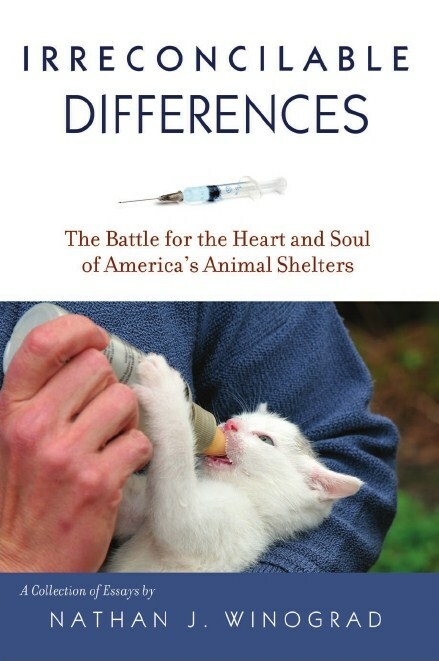 But it was not Wayne Pacelle of the Humane Society of the United States at the podium. It was not Ed Sayres of the ASPCA. The shelters with better than 90% save rates were not in cities with names like Charlottesville, Reno, or Tompkins County. Instead, they were in cities called Wellington, Waiheke, and Waihi. I was over 6,000 miles from the U.S., in New Zealand. The speaker was Bob Kerridge representing the Royal New Zealand SPCA, the national organization that oversees all SPCAs in the country. And he was providing that which Pacelle and Sayres, staunch proponents of shelter killing in this country, have proven themselves incapable of: leadership. We think of New Zealand as being in the bottom of the planet, but in space there is no up or down. 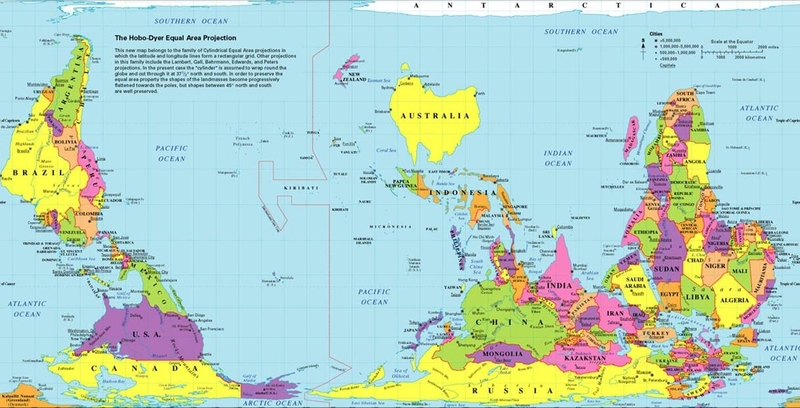 The map of the world in places like New Zealand is the opposite of what ours looks like. There, New Zealand is on top and the U.S. is on the bottom. And when it comes to how the large national animal protection organizations in those countries behave today, that is more appropriate. One of the things I enjoy most about traveling is the education I get. Traveling promotes perspective, not just for the place you are visiting, but for home as well, by allowing you to see, and often appreciate, those things to which familiarity has made you blind. And that is what my most recent trip to the national conference in Rotorua, New Zealand did for me. For those who continue to parrot the idea that “HSUS is changing” or “HSUS has changed,” take note. By contrast to the bold path launched by the RNZSPCA, Pacelle’s begrudging and feeble efforts to appease his critics, or Ed Sayres’ cynical and disingenuous “No Kill” plan, Mission: Orange, pale in comparison. Imagine for a second if what occurred at the national conference in Rotorua, New Zealand occurred in Nashville, TN at this week’s Expo conference by HSUS. I am not talking about a “separate” day-long workshop by Maddie’s Fund, which Pacelle agreed to as long as Maddie’s Fund coughs up money, does not use the term No Kill, and I am not allowed to speak (these are the terms Pacelle extracted for agreement to allow the workshops). I am talking about Wayne Pacelle himself telling the assembled shelter workers, managers and animal control officers that the days of killing are finished, that shelters must save lives, that they can and should adopt their way out of killing, and that HSUS was ready to help, with resources and with expertise. 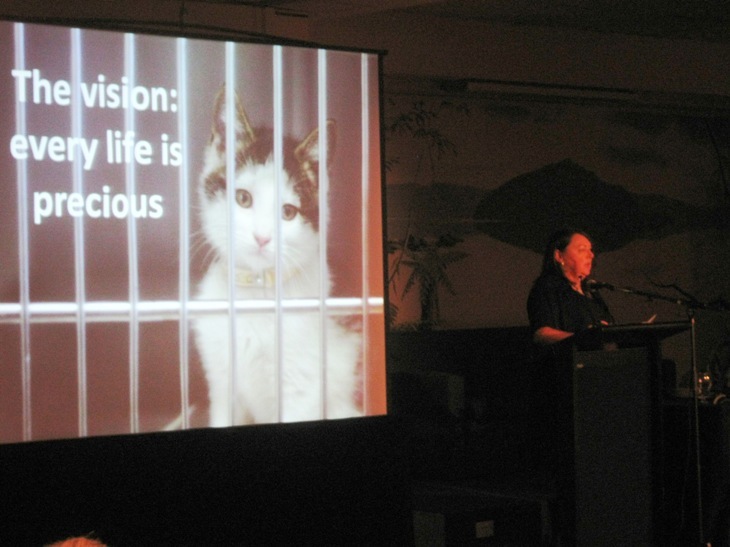 Imagine HSUS providing a handbook on how to do it, as the RNZSPCA did at their national conference. Only time will tell how long allegiance to their kill-oriented colleagues, to their antiquated philosophies, and to their failed models, will hold them back from the success they and this movement can achieve the moment they decide to embrace it. Instead, the ASPCA fights a law to save lives, HSUS calls for animals to be killed in shelters, and the American Humane Association continues to fade into oblivion. Up is down, down is up. I was in New Zealand as a guest of the Royal New Zealand SPCA. I was there to deliver the keynote at their national conference, and to hold day long workshops in shelters across the country. With hundreds of people from shelters across New Zealand, I did not stand before them waving the American flag. I shared with them our successes, our failures, our hopes, our dreams, the path we are forging in spite of HSUS, the battle not with the many but with the few: the ASPCAs and SPCAs intent on killing despite rescue alternatives, the obfuscation of groups that claim to support No Kill but are willing to sacrifice animals to retain positions of power or in deference to their killing cronies. And then, on a tour prearranged by the RNZSPCA, I spent the week flying throughout the country: to Auckland, Wellington, and Christchurch, meeting with shelter leaders and staff, holding day long workshops on adoptions, saving shelter dogs, reforming BSL, embracing TNR, overcoming the claims of Invasion Biologists who want to scapegoat free roaming cats for the habitat destruction and wildlife decline as a result of one species and one species alone—humans. The U.S. is still ahead of the pack, the movement that was born here is still very much a U.S.-led effort now spreading around the globe—to Australia and New Zealand. And while our pioneering spirit has shown the way, the likelihood of the U.S. being first to cross the goal line is in doubt, despite our 15 year head start. The reason comes down to leadership. The RNZSPCA is providing it. The ASPCA is not. The American Humane Association is an irrelevancy. Other groups which claim to do so are long on rhetoric and short on substance. HSUS, the closest equivalent to the RNZSPCA, says we aren’t killing animals, says they can’t stand No Kill, and has been one of the primary roadblocks to the achievement of a No Kill nation in the United States. Time and time again, progressive activists in communities across the nation working to reform their cruel and antiquated shelters must overcome the national organizations which are working against them. It is a cliché but it bears repeating: these are insecure times and many people feel nervous. Change is a bit scary for some, even under the best of circumstances. And too often, those in positions of power exploit these fears to maintain the status quo. The status quo is the known. It is comfortable, even if indefensible ethically. But our adaptability, our ability to change is a hallmark of our species. And most people will change; institutions can be reformed, when someone shows us a better and kinder way. But that takes leadership. The most important element of the No Kill Equation. That is what is being provided in New Zealand. And that will make all the difference in the world. Will it be a seamless transition? Will it be without roadblocks? Of course not. Even while I was there, I read in the local paper that the local pound in Rotorua took in about 450 dogs so far this year, killing half. But after 176 were reclaimed by owners, they found homes for only 32. The animal control officers don’t take responsibility for that meager result, they blame the public. Clearly that has to change. In many ways, New Zealand is further behind us. Legally, all Pit Bull-type dogs are considered “dangerous,” a law that is screaming for repeal. Animal Control officers end the lives of animals by shooting, and some shelters are still gassing. Cats identified as “feral” can be killed on impound. Some pounds are regressive and won’t work with SPCAs, content to pass the blame to others, to fear monger about dogs and put them to death. Some SPCAs won’t work with the pounds despite the ability to transfer dogs to reduce killing, and despite endowments valued in the millions. And shelters kill despite empty cages. Sound familiar? It should. These are issues we face in the U.S. In the U.S., slowly but surely we are overcoming them as they will in New Zealand. But in New Zealand, they have what we don’t. Traveling with me across the county, organizing the effort, providing support and guidance to local shelters was Robyn Kippenberger, the CEO of the RNZSPCA, the Kiwi equivalent of HSUS’ Pacelle: “What do you need?” “How can we help you?” was the question I heard her ask shelter staff time and time again. That is what she asks, and she has plenty to offer. In fact, after receiving an unexpected but sizable grant to the RNZSPCA to help with the campaign, Kippenberger did what is inconceivable to imagine Pacelle—with his sordid history of fraudulent fundraising by taking credit for the hard work of local organizations—doing: she split it equally between every SPCA in the nation and mailed out the checks that very week, without fanfare or self-aggrandizing press releases. 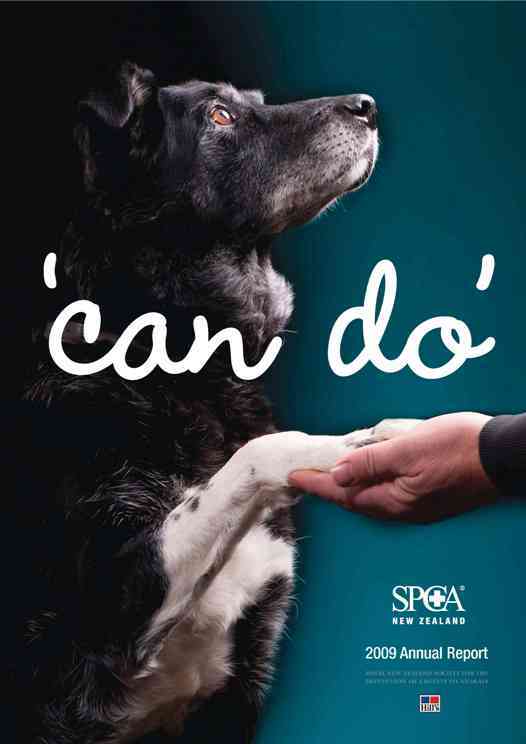 As the RNZSPCA said to the nationally assembled groups at the conference in Rotorua, “what must be done, can be done, and will be done.” And the RNZSPCA is willing to help in any way they can. In the end, that is why New Zealand is likely to cross the goal line first. And when it does, the country at the bottom of the world will be on top—and help lead the way to our inevitable and collective No Kill future.